Of course, you can still join us for this wonderful and flexible Summer intensive, see all the details here. If you´re participating, don´t hesitate to add the link to your What´s Up Wednesday post on Jaime´s blog here. From there, you can also discover new blogs and encourage other writers! So anyways…on an happier note, I am super duper excited to dive into Ghenet’s revised manuscript. I’ve read it once already and LOVED it so beta-ing it is really something I’m looking forward to. Her eyes widen and she shakes her head. “I know you remember that.” She sighs and glances away. I’m currently in Riga for a business trip and the city is beautiful! Going outside and feeling the sun. Next postWhat´s Up Wednesday? And Ready. Set. Write Giveaway edition! I’ve heard great things about Riga! Hope you get enough time to enjoy it. I know what you mean about the emotion in CNV. Personally I didn’t cry, but I know most people do near the end. So cool you get to read Ghenet’s manuscript! And what a cliffhanger in your snippet there. Dun, dun, dun. Riga LOOKS beautiful! Lucky you! Also, that excerpt. THAT EXCERPT!!! Holy suspense thrillers. I am very much looking forward to reading this. Could you please hurry with these revisions?! I hope you have a wonderful and productive week! I just finished up CODE NAME VERITY and I think I also read with a sense of detachment b/c I knew something tragic was going to happen. Enjoy your time in Riga and good luck with writing this week! Congrats on the writing goals 🙂 Being able to finish revising a chapter is wonderful! Good luck with this weeks goals! I can’t say Riga was ever on my list of places I need to visit, but from your picture, maybe it should be. It does look like a nice place to visit. All the best with your revisions, Elodie! What did he do to her? OMG what a great excerpt. Good luck with your goals this week. I can understand your reaction to Code Name Verity, it just destroyed me. Good luck with your writing goals this week, the excerpt you shared was fantastic! Hi! *waves* I’m new here. Nice to ‘meet’ you. 🙂 I am late to the Ready Set Write party, but I’m here, and did my WuW post today, like a good girl. Holy shizzballs, what a creepy cliffhanger of an excerpt!!!! O_0 I’d read that in a second. Man, I’m green with envy of your European commuting adventures. 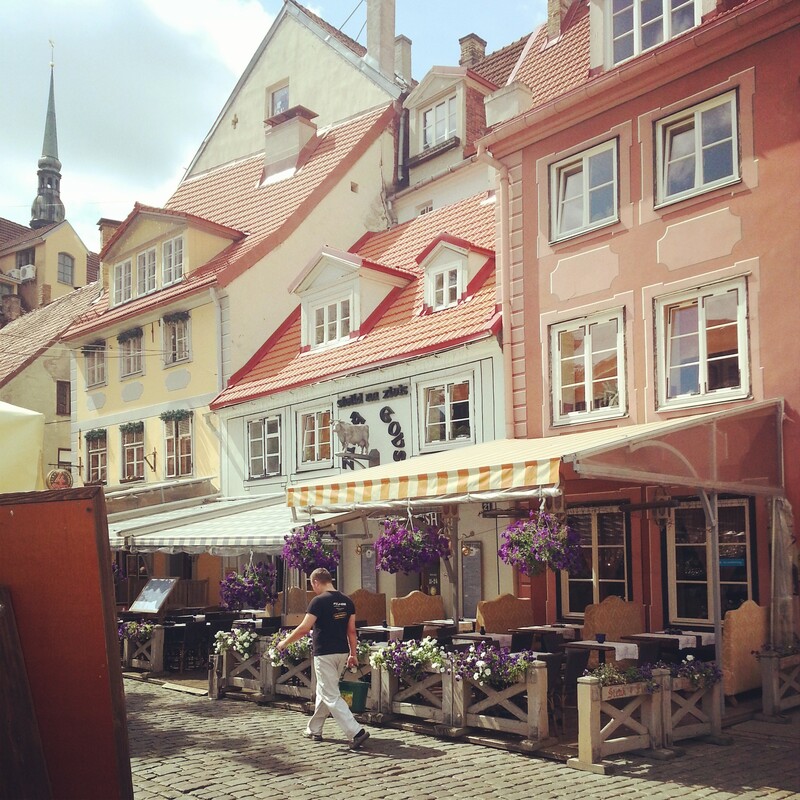 *dreamy sigh* Riga looks charming and I want to be there, writing at a cafe right now. This snippet you’ve shared packs a lot of punch, especially the way you’ve ended it! You’ve created a really clear image here, Elodie. Let me know when you want to start sending the odd chapter my way. OMG, such a sad, creepy excerpt! I don’t know how you’re managing to make a pageant-murder-thriller-romance feel so grounded, but none of it feels over-the-top. Can’t wait to see more! And the MS I mentioned in my post today is Ghenet’s–seriously, I just want to sit and read it all at once! Stupid having to do stuff! Oh Elodie, your snippet is absolutely gripping! I want to know more, and you are cruel for leaving us hanging like that! Also, please do re-read CODE NAME VERITY. It was one of my top reads last year. I understand what you mean about maybe not letting yourself get too caught up in it. I think I was a little like that too, but it still blew me away – which is why I want to re-read it. It probably didn’t help I was reading it on and off while traveling. Riga is so lovely and quaint! Your pics are giving me wanderlust! Sending hugs for when you finish VERITY. What a book. Also–I want to read Code Name Verity, but I’ve held it off for similar reasons to what you’re going through now. I did the same thing with The Fault In Our Stars. I have to be in a place to let myself be broken, or the book just won’t work for me. That photo from Riga is gorgeous. And I LOVE your excerpt. So much emotion, and so evocative. Well done, friend. Best of luck with your goals for the coming week! Hmm…I have Code Name Verity on my list. You said putting it off until fall. Is it a fallish read? I’m a very seasonal reader. I like beach reads/warm weather books in summer, darker books in fall/winter. Is that strange?! I have so many books that I want to read but I’m not letting myself until it’s cooler outside because I know I’ll enjoy them more. How could you leave me hanging like that?! WOW!!! Great excerpt. Good luck on your goals this week!!! Sounds like trouble in your WiP! Good luck on your writing goals! HURRY UP AND FINISH THAT MANUSCRIPT PLEASE. I love the excerpt! You did an excellent job of building suspense. I didn’t see the, “…and he was too busy planning how he would kill her…” part coming. Whaaaat?? I hope you share more! Great excerpt! So intense! I’m glad to hear you’re making so much progress on your revision. That’s so cool that you get to visit new places for work. I’m jealous! Thanks for the YA Buccaneers shout-out! And I’m so happy you’re reading my MS again. Can’t wait to hear what you think!